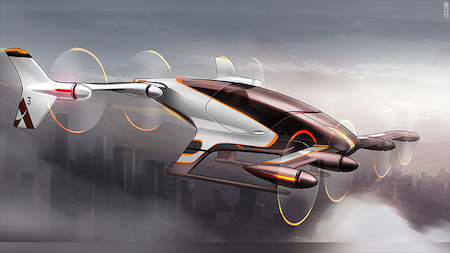 Europe's Airbus is working on Uber-like taxis - that fly. It is developing Vahana through its A3 unit, which formally opened this year in San Jose, the heart of California's tech community. Airbus made an initial $150 million funding commitment for its new venture capital unit, which is seeking out investments in disruptive technologies to speed up innovations in aerospace. "The aircraft we're building doesn't need a runway, is self-piloted, and can automatically detect and avoid obstacles and other aircraft," A3 chief executive Rodin Lyasoff wrote in September. "Designed to carry a single passenger or cargo, we're aiming to make it the first certified passenger aircraft without a pilot." By the way, the use of the word "vahana" may tell you something about the team working on the flying taxi. It's a sanskrit word: वाहन, Vāhana, literally "that which carries, that which pulls". All of the Hindu deities have a special mount, or vahana, to carry them around.